Of all the colours and materials available for a pocket handkerchief, white linen is probably considered the smartest and most formal. Why? Well it’s a question of two factors – compliment and contrast. A silk tie is intuitively smarter than a wool or linen one. The shiny lustre of the silk and the way it contrasts with the matte texture of the suit creates a pleasing contrast. So why isn’t the same true for handkerchiefs? Why isn’t silk smarter than linen? Probably because the contrast between silk and wool has already been done with the tie selection. More silk would be too much. Instead, white linen echoes the sharpness and matte texture of the suit, complimenting rather then contrasting. This is also the reason a wool handkerchief would be too casual. Yes, it is matte and rough in texture like the suit, but it is not sharp like the suit. It only shares some of the same characteristics. So this is the rule. Or rather, this the reason that men of taste have generally worn a white-linen handkerchief with their wool suit and silk tie. There was a period where cream silk was dominant, but linen has generally been more common, and certainly looks more appropriate today. So how to break the rule? Well, most men don’t wear a tie every day. If you don’t, there’s no silk to contrast with your suit – which is a pity. So you could a coloured silk handkerchief instead of a linen one when you are tie-less. Generally I go between linen, silk and wool depending on how smart I want to be. 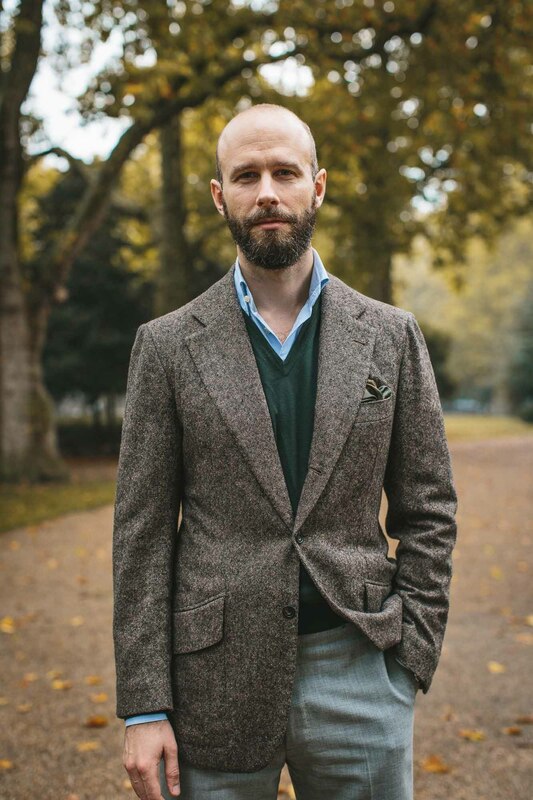 Another way that the rule is broken: tweed jackets. Men of style will often say they like silk handkerchiefs with their tweed jackets because of the contrast in texture. But they weren’t saying that about their suit were they? Then it was all about compliment. One reason is that woollen or casual ties are often worn with tweed. Another may be that the sheer roughness of tweed needs greater silk to balance it. Certainly, a silk handkerchief is often worn when tie-less with tweed. Having understood the principles behind this behaviour, it is easy to find creative ways to make use of its wisdom without necessarily following it. In this case, be aware that all decisions with accessories are about complement and contrast. That’s why a white-silk handkerchief with a tie often looks a little cheap and feminine. And it is a good argument for wearing woollen ties or handkerchiefs with modern, shiny worsteds. Just not both, probably. You can follow the discussion on The rules and how to break them 7: Handkerchief texture by entering your email address in the box below. You will then receive an email every time a new comment is added. These will also contain a link to a page where you can stop the alerts, and remove all of your related data from the site. That’s a ridiculously beautiful suit/ensemble. Is it tweed? Indeed and thank you. Tweed three-piece from A Suit That Fits, scarf from Drake’s and silk handkerchief from Etro. And the more unique for it, as well. I checked their site this afternoon and they’ve nothing left resembling that pattern in tweed. But the fact that you’re wearing it gives me more confidence in trying their services, so thank you for the unspoken recommendation.